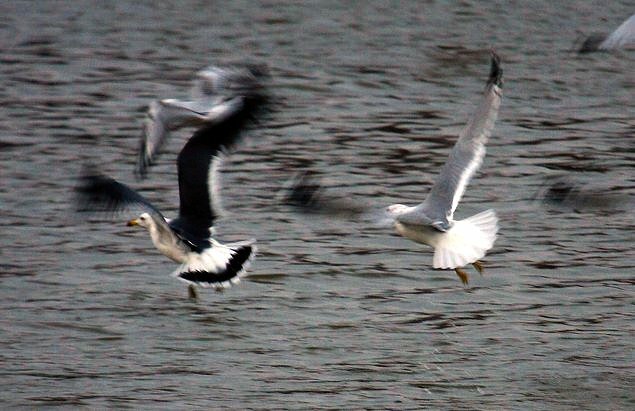 Anything Larus: Ohio Black-tailed Gull: Take Two. Every birder has experienced it - you score a life bird but know in your heart of hearts that the looks you got were "crappy", bordering on unidentifiable were it not for expectations. 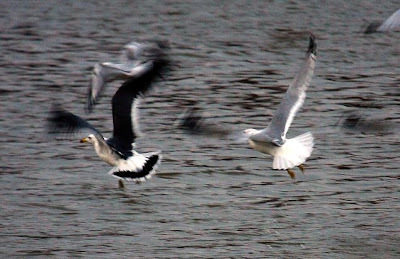 On Sunday, November 20th, I drove out to Ashtabula Ohio for their first state record of Black-tailed Gull (Larus crassirostris). It was found by Ohio birder Craig Holt a few days prior on 16 November. I got to Ashtabula and found the bird around 8:00 a.m. YES! LIFE BIRD! The looks I had were very brief as I watched it preen in the water for about one minute, standing from an elevated bridge, looking into a channel some 400 yards away. I was really excited when it got up as the black tail sealed the ID for me, but it continued in the opposite direction. It flew off to the northwest. I knew I was in trouble as this bird had the habit of disappearing early in the morning with no particular pattern. This sort of birding is agonizing. If one misses that short window in the morning, they may be "tethered" to that site for the rest of the day. I waited for it to return for almost 3 hours before I gave up and moved on. I bummed around various harbors and river mouths in the area and then drove home, a drive a little less than 6 hours. The entire experience was bittersweet: "I'm not happy with those looks", I thought. I decided to go back 4 days later, but this time, I took the advice of Ohio birder Jen Brumfield, who advised we get there before first light. We did. Andy Sigler, Chris West and myself got there about an hour before sunrise and waited. We started scanning the channel, literally, at the crack of dawn. It was still dark out but we were able to make out the silhouettes of perhaps 2,000 gulls in the channel to the north. A Carolina Wren gave a morning murmur from the overgrowth below the bridge. Within a few minutes, the gulls started to move over the bridge and into the marina area along the river. I walked down the bridge and situated myself at the marina where I began chumming. The Ring-billeds responded well. I thought that if the Ring-billeds caused enough commotion, the Black-tailed would fly in to investigate. Adult Black-tailed Gull with Ring-billed. Ashtabula, Ohio; 24 NOV 2011. Black-tailed Gull. Note the significant width of the white terminal edge to the tail. The waters of Lake Erie are a major staging area for Bonaparte's in the fall. Numbers peak in late November where aerial surveys have estimated 100,000+ of these tern-like gulls over the lake (McCormac, 2011). This is much different than the western Great Lakes: Superior and Michigan. The reason for this huge gathering of Bonaparte's is no other than an abundant supply of shiners and shad which are commonly found at the mouths of rivers as they feed into the lake. 1st cycle Bonaparte's. Lorain Harbor, Ohio. 24 NOV 2011. Adult Bonaparte's with full hood in November. It didn't take too long for it to swallow this entire shad. Other birds of note here included a first cycle Franklin's, an adult Thayer's, an adult Lesser and up to 10 Great Black-backeds. We then drove to Huron Harbor which is a fun little site with enough birds to hold its own. Huron Harbor has attracted a nice list of rarities in the past, including Spotted Redshank and Northern Gannet. There were "only" about 1000 Bonaparte's here with a few Lessers mixed in (two 2nd cycles and a 1st cycle). 2nd cycle LBBG. Huron Harbor, Ohio; 24 NOV 2011. Huron Harbor, Ohio; 24 NOV 2011. This bird was tagged at Dime Pier in Chicago in 2007. To read more about these patagial tags, click here. Whether this bird spent the summer in Chicago or on Lake Erie is a mystery, but I recently found out that some of these Chicago Ring-billeds have been seen on Lake Erie before. All and all, it was a fruitful day with better looks at my "lifer" Black-tailed and hordes of gulls everywhere we went. Something tells me I'll be going back to Lorain soon!